PT Alpine Pressurized Insecticide is a Reduced Risk non-repellent aerosol for control of crawling and flying insects. All Alpine formulations contain the active ingredient dinotefuran, a new non-repellent to the pest control industry that the EPA has granted reduced-risk status for public health use. PT Alpine Pressurized Insecticide aerosol is a contact kill (non-residual) insecticide for use as a crack and crevice, void, spot, or injection treatment for the listed Insects. Alpine PT Insecticide Aerosol is a pressurized insecticide with the Reduced-Risk and non-repellent active ingredient dinotefuran. Dinotefuran works through contact and ingestion and disrupts insect nervous systems for fast, effective control. Dinotefuran is a newer active ingredient in the class of insecticides called neonicotinoids, disrupting the insects’ nervous system and causing paralysis and death. Products with dinotefuran, such as the PT Alpine line, are granted an official “Reduced Risk” status by the EPA. Dinotefuran kills pests on contact. Pests must be directly contacted at time of application in order to be effective. Alpine PT Insecticide Aerosol is a reduced risk nonrepellent aerosol, so it should be considered effective as a contact spray only. Ants, carpenter ants, bed bugs, Asian lady beetles, boxelder bugs, crickets, stored product pests, pantry pests, roaches, silverfish, fruit flies, phorid flies, stink bugs. PESTS CONTROLLED: Ants (including foraging Carpenter, Fire, Harvester and Pharaoh Ants), Asian Lady Beetles, Bed Bugs, Booklice, Boxelder Bugs, Brown Marmorated Stink Bugs, Clover Mites, Cluster Flies, Crickets, Dermestids, Drugstore Beetles, Earwigs, Elm Leaf Beetles, Flour Beetles (Red and Confused), Fruit Flies, German Cockroaches, Grain Weevils, Indianmeal Moths, Millipedes, Phorid Flies, Pillbugs, Powder Post Beetles, Silverfish, Sowbugs, Spiders (excluding Black Widow), Springtails and Trogoderma. Alpine PT Insecticide Aerosol is a versatile and unique ready-to-use insecticide. Use Alpine aerosol for contact kill, crack and crevice treatments, and injection treatments for a variety of common pests, including ants, roaches, and spiders. Alpine is a non-repellent insecticide, meaning it can be used in conjunction with baiting programs or with residual non-repellent insecticides, and is a great spray for ants, cockroaches, and bed bugs. Because of its Reduced Risk EPA status, Alpine is a great choice for sensitive environments, especially in areas where the use of residual sprays is prohibited or undesirable. Unlike many aerosols, Alpine can be used for outdoor spot treatments, direct treatment of ant nests and trails, and for carpenter ants in trees, stumps, utility poles, and fences. Use the included straw for crack and crevice, spot, or injection treatments. Alpine PT Aerosol will have a fast knockdown and kill time. Dinotefuran is a non-repellent, so Alpine PT Aerosol is effective primarily as a contact kill: it has no further insecticidal properties once the spray application is dry. Use Alpine PT Insecticide Aerosol where listed pests are found or known to harbor for contact, flushing, void, or injection treatments. Use with the supplied actuator and injection tubes or other aerosol equipment. Place injections into cracks, crevices, holes and other small openings where insects may be harboring, living and breeding. For light infestations, move injection tip along cracks while treating at the rate of 3 ft/sec. For heavy infestations, move injection tip along at 1 ft/sec. For closed voids, calculate the void’s cubic area and treat at the rate of 1-5 sec/3 cubic ft. Several holes may be required in long-running voids. Reapply as necessary. Use with the supplied actuator and injection tubes. Hold container upright while spraying. Direct nozzle approximately 12” from surface to be treated. Apply directly on insects in these locations when possible. Reapply as necessary. Exact yield will vary with use because this is a ready-to-use product. The large 20 oz. can yields many applications. In and around Apartments, Campgrounds, Homes, Hospitals, Hotels, Motels, Non Food Areas (Meat Packing and Food Processing Plants, Restaurants, Supermarkets), Nursing Homes, Resorts, Schools, Transportation Equipment (Buses, Boats, Ships, Trains, Trucks, Planes (do not use in aircraft cabins)), Utilities, Warehouses, and other Commercial and Industrial Buildings. Crawling Insects: Apply as a Crack & Crevice or spot treatment where insects are harboring, traveling or breeding. Reapply as necessary. For example, openings around pipes and sinks, under refrigerators, pantries, behind baseboards, washing machines, stoves, cabinets, sewer, floor drains and meter boxes. In commercial areas, apply as a Crack and Crevice or spot treatment in office areas, stainless steel equipment, shelving, machinery, storage areas, pallets, and other areas where insects may be harboring, traveling, breeding or entering the structure. Bed Bugs: Apply as a Crack & Crevice or spot treatment where evidence of bed bugs occurs. This includes bed frames, box springs, inside empty dressers, clothes closets and carpet edges, high and low wall moldings and wallpaper edges. Do not use this product on mattresses, pillows, bed linens or clothes. Remove all clothes and other articles from dressers or clothes closets before application. Allow all treated areas to dry thoroughly before use. Reapply as necessary. Not recommended for use as sole protection against bed bugs. If evidence of bed bugs is found in/on mattresses use products approved for this use. Fruit and Phorid Flies: Treat cracks, crevices, voids, holes and small openings where these insects may be harboring, traveling, breeding or entering the structure as adults or larvae. Pay particular attention to breeding sites and areas containing debris. Spot treatment to surface resting sites not associated with food or food preparation areas, of the adults, is permitted. Treatment of the catch basin area of drains is permitted. Crack and crevice or spot treatment to the walls under manhole covers is also permitted. Do not spray product directly down into drains or sewers. Reapply as necessary. Treatment of the Structure from the Outside: Treat where listed insects may be harboring, traveling, breeding or entering the structure. For example, weep holes, under siding, wall voids, soffits, around attic vents, cracks and crevices, openings around windows, doors and pipes and landscape timbers. Treatment of infested fences and tree holes is permitted. Direct treatment of ant trails is permitted. To Kill Foraging Carpenter Ants Living Inside Trees: Determine the highest and lowest elevation of the colony. Drill holes into colony at highest elevation and inject 5-10 seconds. Do the same for lowest elevation. Drill intermediate holes every 4 ft. between the upper and lower elevations if required. Foraging carpenter ants must be directly contacted at time of application to be effective. Contact as many ants as possible. Non-residual treatment. Reapply as needed. Broad-spectrum label for use against: ants, cockroaches, bed bugs, spiders and occasional invaders. Long-lasting non-repellent control of ants. A perfect rotational partner in a nonrepellent program. Reduced Risk aerosol is safe to use in sensitive environments. Do not store or use near heat or open flame. Do not expose to temperatures above 130 degrees F.
Spraying on plants may cause phytotoxicity. Test an inconspicuous area before treating plants. Alpine PT Insecticide Aerosol is a contact kill only. May be used in conjunction with baiting programs or residual non-repellent insecticides. Use only in non-food/feed areas of food handling establishments. Keep people and pets out of treatment area until product has dried. The Alpine spray I bought for Stink Bugs is effective. I spot spray the pests on our porch and door. It doesn't kill them instantly but in a couple of hours I have dead Stink bugs laying all around. I spray around the perimeter of the door and it seems to keep them away for a couple of days. I started using it in the Spring and have only seen a few that did sneak into the house compared to last year. I don't use the spray in the house. FYI, the Alpine dust that I bought didn't seem to work effectively. After application, I haven't seen any ants at all! This is one very effective product and vastly superior to any store bought product like Home Defense! When properly used with crevice wand. 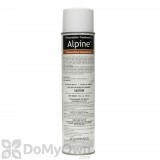 How long does Alpine aerosol last? Is it a contact killing pesticide only? According to the Alpine PT product label, it will only work if you spray the insect directly. No residual properties are left. Is Alpine PT Insecticide Aerosol effective in bedbug control? How does Alpine PT Insecticide Aerosol compare with Suspend SC? Alpine PT Insecticide Aerosol﻿ has just recently hit the market and is labeled for bedbugs. This product has been tested by several universities and has an excellent efficacy rate. Alpine PT is not a synthetic pyrethroid like the Suspend SC, therefore bedbugs have shown no resistance to it at all. The only downside is that it cannot be used on mattresses or other furniture like the Suspend SC. Which product has a longer residual, Alpine PT Insecticide Aerosol or PT 221L? Which would be better to treat for roaches? Alpine PT Insecticide Aerosol is a contact kill (non-residual) insecticide for use as a crack and crevice, void, spot, or injection treatment for listed pests. PT 221L Residual Aerosol has a long residual (3-4 weeks) and is labeled to control a wide variety of insect pests including roaches. For more information on controlling roaches, please take a few moments to review our treatment article on How to Get Rid of Roaches for a successful eradication program. We would suggest the products in one of our Roach Control Kits. Alpine PT Insecticide Aerosol - 20 oz. will kill indian meal moths. You also want to look into using traps like the Pro pest. Does Alpine PT Aerosol work on the brown stink bug? Yes, Alpine PT Aerosol will kill any insect that is applied to or any insect that walks over it while the residual is still active. However, since it is a non-repellent insecticide, it does not have a very quick knock-down. We have many products that are labeled for stink bugs, which you can find on our stink bug page.